Axel Trolese was born in 1997 near Rome and started to play the piano at the age of 5. From the age of 14 years old, he attended master classes with Maurizio Baglini and at the age of 17 he completed the Italian Conservatory Diploma under his guide with highest grades and an Honorable Mention from the Monteverdi Institute of Cremona. He followed at the same time annual master classes with Roberto Prosseda and Alessandra Ammara. He now lives in Paris, where he is currently attending the National Superior Conservatory (CNSMDP) with Denis Pascal whilst also studying with Benedetto Lupo at the Academy of Santa Cecilia in Rome. 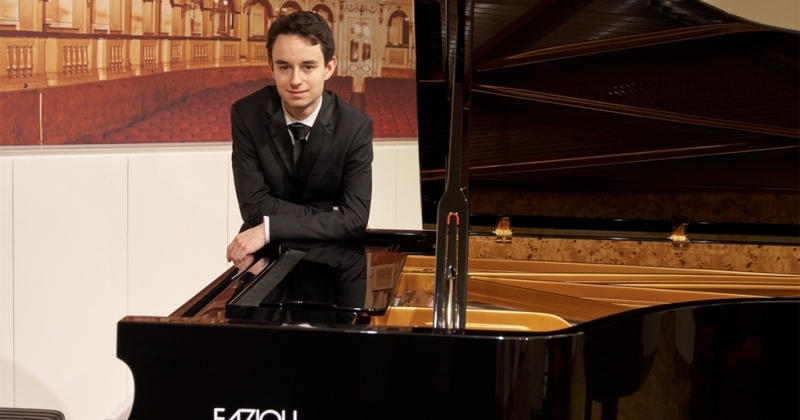 He has just been awarded the 2nd Prize for the Ettore Pozzoli Competition in Milan and made it to the semi-final of the Suzhou International Piano Competition of Shanghai last November. He was amongst the 10 best Italian musicians for the Young Italy Award 2017. In June 2017, he won the 1st Prize and the Public Award at the Grand Prix Alain Marinaro. In 2016, he was awarded the EduMus Prize, a recognition given to the best young Italian musicians. In 2015, he won the Casella Prize during the Venezia Prize 2015 Competition, which was held in the historic La Fenice Theatre of Venice. Axel has performed in many important European concert halls, including Venice’s La Fenice Theatre, Paris’ Italian Institute of Culture, Paris’ festival Les Spiriades, Rome’s French Academy, Rouen’s Museum of Fine Arts, St-Germain-en-Laye’s Home/Museum Claude Debussy, Tignes’ Auditorium, Weimar’s Weimarhalle, Füssen’s Festspielhaus, Rome’s Philharmonic Academy, Sacile’s Fazioli Concert Hall, Padova’s Sala dei Giganti, Cremona’s Ponchielli Theatre, Ischia’s William Walton Foundation and many others. He has participated to numerous Masterclasses with pianists like Arie Vardi, Aldo Ciccolini, Michel Béroff, Philippe Entremont, Wolfram Schitt-Leonardy, Yun Sun, Inna Faliks, Enrico Elisi, Joaquín Achúcarro, Piero Rattalino, George Vatchnadze, Varduhi Yeritsyan and Giovanni Bellucci. He has also played with orchestras like the Jenaer Philharmoniker and conductors like Markus L. Frank, Ovidiu Balan, Jesús Medina, Pasquale Veleno, Alessio Venier and Gabriele Pezone.